The patient lies on his back with his feet flat on the ground and 60 degrees flexion in the knees. Now the patient has to press his lower back against the ground while exhaling by tilting the waist/pelvis backwards. 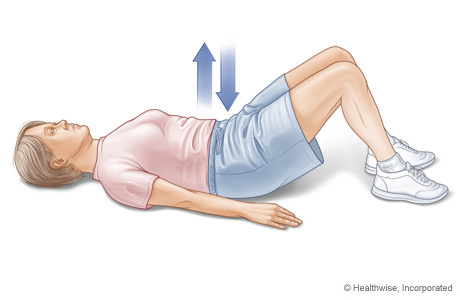 On inhalation, the patient then relaxes the lower back from the ground by tilting the waist forward. Try only to move the lumbar spine.